Today only Woot.com is offering this Simmons Curv 3" Gel Mattress Topper starting at $52.99 (Reg. $219.99)! Sizes Twin to California King available. Select the gel memory foam topper that's perfect for you. Instantly upgrade an old mattress. Memory foam infused with gel reduces pressure points and creates more airflow for a more restful sleep. Overtime traditional mattresses lose their support, which leads to discomfort and lack of sleep. 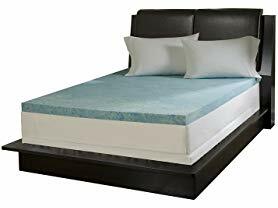 Adding a Simmons Curv Flat Gel Memory Foam Mattress Topper brings an old mattress back to life, and in many cases actually makes it better than before. Gel infused memory foam provides comfort and helps alleviate pressure. Simmons gel infused memory foam has been designed to provide the ultimate in cool cradling support, reducing sleep disturbances throughout the night. You will get a deeper more restful sleep and wake up feeling rejuvenated.